The Navajo (Diné) tongue of Code Talker Chester Nez helped pave the way to an Allied win in the Second World War. Though unmistakably proud of his ability to serve the United States in a unique way, he was aware of the irony in what his wartime work involved. “All those years, telling you not to speak Navajo, and then asking for help with that same language… it still kind of bothers me,” he told USA Today in 2002. Nez’s parents were barely considered citizens by mainstream society when he was born in 1921. Their sheep were slaughtered in the 1930s by a government that determined Navajo herds were overgrazing the region. He recalled in Code Talker, a 2011 memoir written by Judy Avila, that his family was reduced to subsistence farming and stretches of days when they had no food. Nez’s mother died when he was three, and at nine he entered the first of a series of boarding schools where students had their language beaten out of them. Assigned the English name Chester, after President Chester A. Arthur, his Diné name was lost over time. He was intrigued by army recruiters who visited his high school in 1942. They were looking to recruit young men, bilingual in English and his forbidden Diné. He left for basic training later that year, becoming one of 29 Navajos assembled for a special assignment – devising a code based on their mother tongue. In the months after the Japanese attack on Pearl Harbour in 1941, American military planners faced enemy interception of radio transmissions. Elaborate codes, which took more and more precious time to decode, were being cracked. The plan to use Navajo was the brainchild of First World War veteran Philip Johnston, who had grown up amongst the Diné as a missionary’s son and spoke the language fluently. At first, the task seemed insurmountable “because even amongst ourselves, we didn’t agree on all the right Navajo words,” Nez said. But over 13 weeks, they came up with words that represented the letters of the alphabet. “Wol-la-chee”, the Navajo word for “ant”, represented A; “na-hash-chid”, the word for “badger”, was B, and so on. They also invented words for the most frequently used military terms, and in a stroke of brilliance, used poetic circumlocutions for some of them: America, for instance, became “our mother”; a submarine was an iron fish; a grenade, a potato; a battleship, a whale. Adolph Hitler became “Moustache Smeller”, while Mussolini was “Big Gourd Chin”. The result was a system that sounded nothing like Diné, yet could be employed with ease by those trained in its use. The crew memorized their code and practiced sending and receiving messages to each other. When the Marines found that the Navajo needed only 20 seconds to send messages, which had taken a coding machine 30 minutes to do, reservation recruitment went wild. Eventually, about 400 Navajo followed Nez’s group into war. Amongst the items Nez took with him when he entered battle were medicinal herbs, a bearskin and corn pollen with which to bless himself. He was in some of the most brutal engagements in the South Pacific, like Guadalcanal and Guam. Not permitted to take leave, the Navajo were considered “hardened by the rigours of reservation life. We often outperformed our white peers. 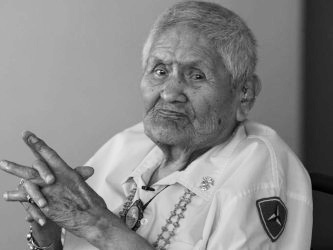 In basic training, Marine sergeants bragged about the prowess of Platoon 382, the Navajo recruits,” Nez said in Code Talker. Because the army kept the platoon secret, they were often taken for Japanese by their fellow American servicemen. Once held captive at gunpoint for two hours, Nez said his skin colour and black hair identified him as the enemy, until guards were assigned to protect his crew from American riflemen. Nez came home to an unfriendly America and little glory. Sworn to secrecy in case the code was needed for another war, he wasn’t able to speak of his service. Even after the Navajo operation was declassified in 1968, he and others weren’t recognized for their work until 60 years later, when in 2001, the original 29 Code Talkers received congressional gold medals. Nez was unable to vote, and when he went in uniform to register for his Indian identity card, he was reminded by a Caucasian civil servant that he wasn’t a full citizen of the United States. And then there were the nightmares. Plagued by disturbing dreams, he spent five months in a military hospital. His father came to his rescue, explaining he was being haunted by the spirits of dead Japanese. He underwent a traditional healing ceremony and the dreams largely ceased. After working as a maintenance man in a hospital, Nez turned to art. He studied at the University of Kansas, later finding work as a painter and muralist at what is now the Veterans Affairs hospital in Albuquerque, New Mexico. He married, and had six children, four of whom died before him. His wife, Ethel Pearl Catron, passed away in 1984. Nez passed away on June 4, 2014. He was 93 years old.